It’s an exciting time to work at Defra. There are lots of great digital services being built and fantastic people building them. But to achieve the ambitious targets in our 2020 strategy, we also have to change how we work to support these new services. Now is the perfect opportunity to connect people doing the same role with each other to benefit from each other’s experiences and learn together. I am working as part of a specialist team to support and build Defra’s digital transformation. More specifically I am developing communities of practice that cut across the Defra group, something I’ve previously done in other public and private sector organisations. In any organisation with cross functional teams it’s important to create opportunities to bring people who do the same thing together. Then they can support each other, build capability, share knowledge and experience, collaborate on common problems and develop expertise for the role. This is called a community of practice. In a department like Defra we have people distributed across the country in more than 30 organisations, so we need to put some extra effort in joining them up. 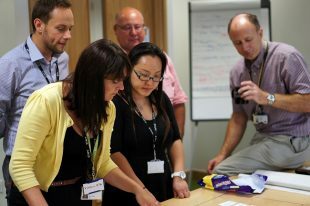 There are a number of communities of practice already forming within Defra group. I’m working with those communities to join them up, celebrate successes and create new communities of practice where needed. Over the last few weeks I have been working with a few of these communities, including delivery managers, business analysts and user researchers. The first step has been getting them together to give them some time together to focus on their communities and to start creating a shared aims and areas for collaboration to grow the community. We’ve had some great sessions with some very motivated members who are already seeing the benefit of getting together.